A woman has become the fastest human on a bicycle, reaching a speed of 183.9mph. Denise Mueller-Korenek, 45, shattered a two-decade-old land speed cycling record which was previously held by a man. Her incredible feat, which has yet to be officially verified by Guinness World Records, took place on the Bonneville Salt Flats in Utah. She rode a custom-made bike that was attached to the the back of a drag racing car until she hit 100mph. The bike was then released and she pedalled in the slipstream of the vehicle which was driven by Shea Holbrook, a female professional racing driver. 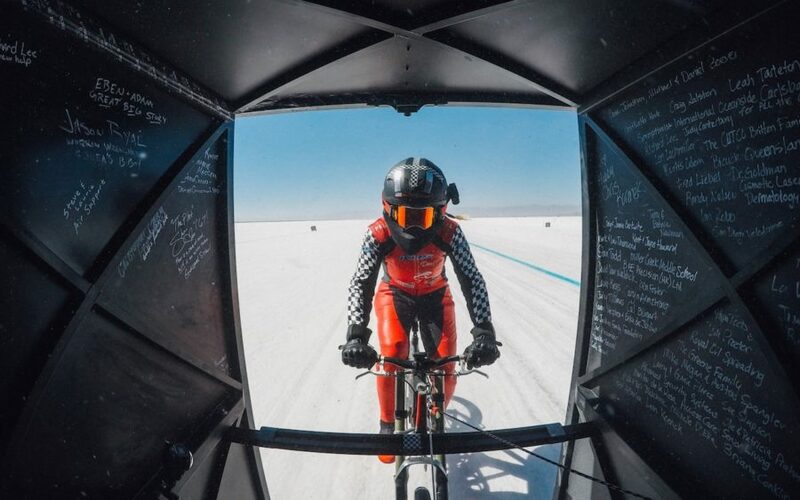 Mueller-Korenek eclipsed her own speed record for a female cyclist which had been 147mph, set in 2016. She also shattered the existing male record of 167mph which has stood since 1995 and was set by Dutch cyclist Fred Rompelber. The cyclist said she had been bounced around at the unprecedented speed. Mueller-Korenek, an American, is a former champion competitive cyclist who retired early to start a family and run a home security business. It would be the first time a woman has held the overall cycling land speed record. The record stretches back to 1899 when cyclist Charlie Murphy used a steam train to help get him to 60mph. It has been broken around 10 times over the last century, always by men. Mueller-Korenek’s bike was set up so that each revolution of the pedals propelled her 128ft. Bikes used in the Tour de France reach about 30ft per turn in high gear. The new record has yet to be officially verified but is expected to be. A spokeswoman for Guinness World Records told The Daily Telegraph: “I can confirm that Denise’s impressive achievement has not been verified yet. “We certainly welcome her to apply and submit this new feat for further review by our records management team. Mueller-Korenek is a mother of three.